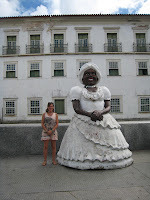 (¯`'•.¸Around the World : Cultures and Tales¸.•'´¯): Axé Bahiaaaa !!! 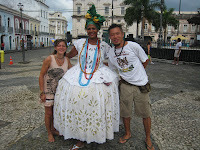 Welcome to Bahia, the craddle of Capoeira! 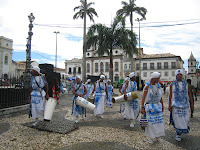 The history of capoeira began in the sixteenth century, at the time when Brazil was a colony of Portugal. 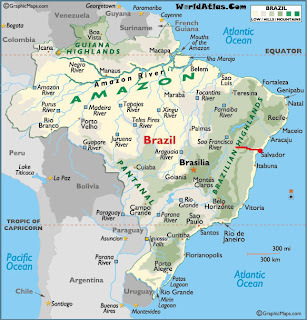 The labor-African slave was widely used in Brazil, mainly in the sugar farms of northeastern Brazil. Many of these slaves came from the region of Angola, also a Portuguese colony. The Angolans, in Africa, did a lot of dances to the sound of music. When they arrived in Brazil, the Africans realized they needed to develop means of protection against the violence of Brazilian settlers. When they flew from farms, they were persecuted by the capitães-do-mato, who had a very violent way to capture fugitives. Slaves were not allowed to practice any type of struggle. Therefore, they used the rhythm and movements of their African dances, adapting them to a type of fight. Capoeira, a martial art disguised as a dance, emerged. By 1930, the practice of capoeira was banned in Brazil, it was seen as a violent and subversive practice. 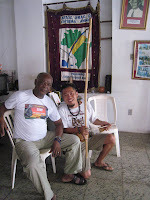 The police received guidance to arrest the capoeiristas who practiced this fight. In 1930, a major Brazilian capoeirista, Mestre Bimba, made a show for the then President Getúlio Vargas. The president liked that art so much that it became the national sport in Brazil. There are three styles of capoeira that differ in movements and rhythms according to the music that accompany the dances. 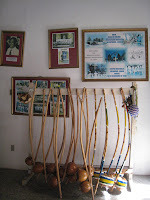 The older style, created in the era of slavery, is Capoeira Angola. The main characteristics of this style are: slow rhythm music, lower movements (nearer to the ground) and a lot of maliciousness. 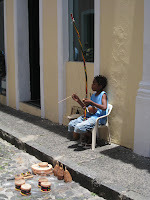 The regional style is characterized by the mixture of maliciousness of Capoeira Angola with the game of quick movements, to the sound of the berimbau. The strokes are fast. The third type of capoeira is contemporary; it unites some of the first two styles. 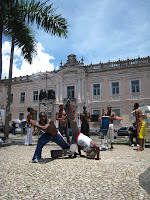 This style of capoeira is the most practiced nowadays. More about the history of capoeira here ! "Laaadeira do Pelourinho, Ladeira do Pelourinho! Ai Meu Deus quanta emoção! Quando tocam nesse nome, me inflama o coração!" A very rich and nice content of this magical art!